How embarrassing! Conquered by people who don’t wear pants. DAWN OF THE PLANET OF THE APES starts exactly where RISE OF THE PLANET OF THE APES (2011) left off, with a killer virus spreading via a world map, extinguishing the human species except for a few pockets of immunes. Apes – war-painted, hunting in concert, led by the regal chimpanzee Caesar, bringing down a wild stag. These apes now have high intelligence and rudimentary speech faculties, mostly “signing” (using sign language that is subtitled), but often lapsing into grunts that eerily form words. Humans – bedraggled, eking out a primal existence in a small San Francisco town overtaken by jungle, with no power. They need to kickstart an old dam to electrify their town; a dam that is in the territory of the apes. Humans and apes clash. Shock, as most of the apes have never encountered humans or their duplicity and underhandedness. Awe, as these human survivors have never encountered these intelligent apes, augmented with the ALZ drug (from the last movie). And despite the efforts of the peaceable leaders of the two factions, the most vicious faction will triumph. And lo, despite his ignorance and intemperance – it is not Man. This is the irony of this fable: that even though peace is sought by the leaders (apes and humans alike), it is only through violence that even the peaceable leaders triumph. Irony, thou harsh, pantsless mistress. 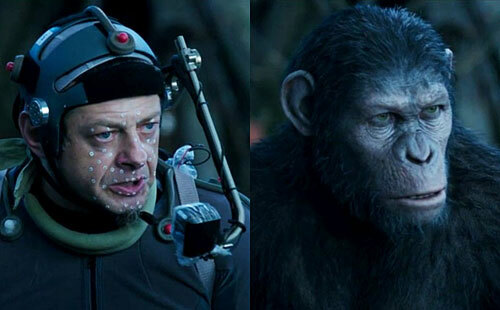 Caesar is Andy Serkis in a motion capture suit, now more ape than man. It is uncanny how the filmmakers, actors and special effects teams have wrought this living creature from whole cloth. Not only is the motion seamless, fluid and realistic, Caesar’s facial emotions run the gamut from wrath to tenderness, from defiance to surprise. In the reality onscreen there is no ape there; it is a computer rendition added to a physical landscape. But in reality offscreen, these ape actors have swapped one ape suit for another. 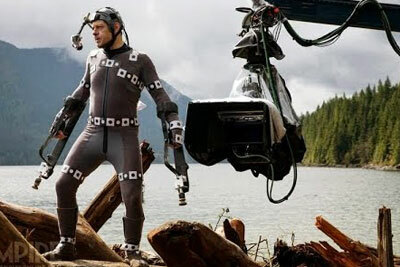 Whereas Roddy McDowall, Kim Hunter and Maurice Evans used to gad about in literal ape suits, Andy Serkis and his simian co-stars wear virtual ape suits: fully covered in color-neutral clothes, bedecked in sensors, with headgear and markers all over their faces and bodies. If they ever start giving Oscars to the special effects themselves, these apes should win hands down. And hairy asses up. The humans are led by vanilla Malcolm (Jason Clarke), an insipid leading man who doesn’t seem to have any presence at all; then again, they didn’t really need a leading man, just a… man. To be in opposition to Ape. Malcolm is a peaceable, intelligent, thoughtful leader (like Caesar), who beseeches Caesar for permission to encroach into ape territory to reactivate the dam. Malcolm’s primal “reflection” is Carver (Kirk Acevedo), whose distrust of apes would make Caesar doubt his own judgment in trusting all humans. 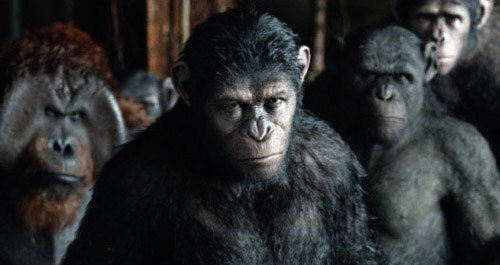 In contrast, Caesar (who grants Malcolm permission and empowers him to use ape labor) has his own primal reflection in Koba (Tobey Kebbell), a cynical, belligerent ape who was tortured in lab tests, and who trusts humans as far as he can fling feces. Koba would in turn make Caesar realize, “I thought I could trust him because he was ape – but humans and apes – the same.” Both Carver and Koba would prove loose cannons that bring down any hope the human-ape alliance might have had of flourishing. The great Gary Oldman (DARK KNIGHT RISES) is underused as Dreyfus, the nominal leader of the human encampment. Keri Russell (THE AMERICANS) is Malcolm’s understanding wife, Kodi Smit-McPhee (THE ROAD) their son. The theme of defining the species is prevalent. Caesar: “I see now how much like them we are”; after their meeting, Malcolm soon realizes about Caesar, “He’s more than just an ape”; ultimately, Caesar must rationalize what he wants to preserve, the ape species or the altruistic nature found in individuals of both species. As Koba hangs from a ledge, after a grudge match with Caesar, beseeching Caesar, “Ape shall not kill ape…” Caesar replies, “You – are not ape!” – and lets him fall. DAWN is a fitting successor to RISE; this time ’round, the production company has not scrimped on the budget. Beautiful locations, detailed sets that look aged and well-worn, massive battles, with music by Michael Giacchino (STAR TREK INTO DARKNESS) evoking Jerry Goldsmith’s percussive motifs. The story is straightforward, the apes eventually raiding the human camp after Koba shoots Caesar and frames the humans. The beauty of this movie is in the care it has taken over its simian special effects – the apes. They are magnificent in every way. From their physical structure, to their movement, facial expressions, and their communication. They use their body language as much as signing and grunting to communicate, and when they actually do speak, it is an effort; the language is not offhanded – as Roddy McDowall and company elocuted – these apes are pushing air through throats, vocal cords, teeth and tongues not yet evolved to accommodate speech. The fiery takeover of the human compound is grim – as apes on horseback gun down humans mercilessly – yet also kinda funny. Y’see, these apes are not the militarized apes from the original PLANET OF THE APES. They’re just starting to understand weaponry, invasion tactics, riding horses… and it seems they haven’t yet grasped the concept of reloading. We never see a single ape reload a single gun. So eventually they’ll just be a bunch of apes with sticks. Shot of Koba, riding hellbent perched on a horse, firing two machine-guns Arnold-style, screeching in manic fervor. Some screenwriter got his jollies out on that scene. Movie opened on Caesar’s eyes, war-painted, in a hunt for food. Movie closes on Caesar’s eyes, that of a leader, looking for a nice pair of pants. Writers: Mark Bomback, Rick Jaffa, Amanda Silver, Pierre Boulle. Starring: Andy Serkis, Jason Clarke, Gary Oldman, Keri Russell, Toby Kebbell, Kodi Smit-McPhee, Kirk Acevedo, Nick Thurston, Terry Notary, Karin Konoval, Judy Greer, Jon Eyez, Enrique Murciano, Larramie Doc Shaw.